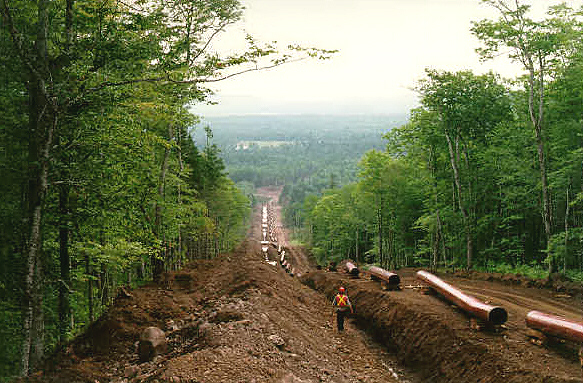 In the summer of 1999, the Maritimes and Northeast Pipeline Company excavated an 8 foot deep trench across Nova Scotia to host the Sable Island gas pipeline. 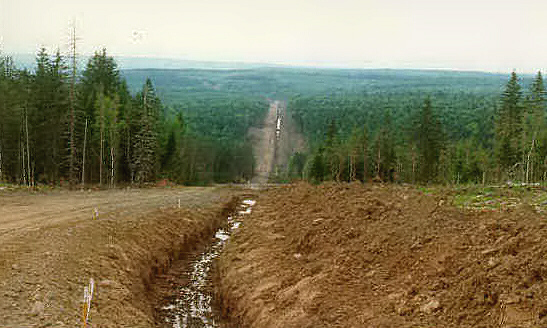 The "great ditch" exposed a continuous transect of surficial deposits along a 237 km corridor. A wealth of geological information was found on this trek; buried soil horizons, mineral deposits, sand and gravel deposits, and groundwater springs, to mention just a few. 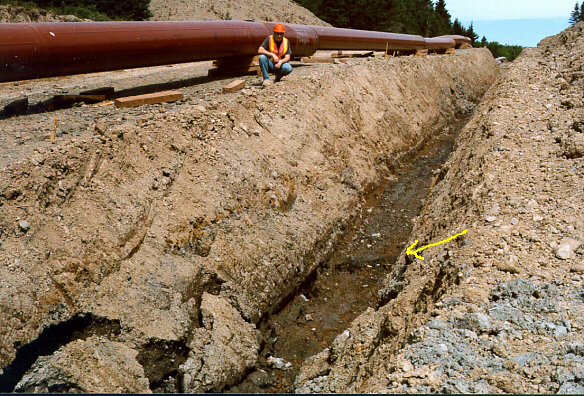 The continuous exposure of glacial deposits and bedrock can be linked to the topography that the pipeline crosses. These data can help geologists predict soil conditions throughout the province. 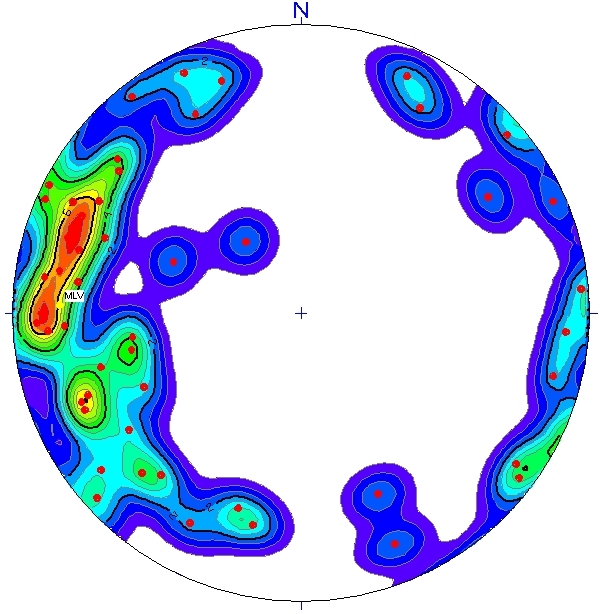 Dots are locations of some of the buried, radiocarbon-dated soils and peat. Buried peat bog near Amherst. Note the peat (black) underneath layers of poorly sorted sand and silt up to 2 m thick. This area is part of a flat plain, either a former floodplain or a lake basin. The size of the floodplain is out of proportion to the ephemeral stream that drains the area today. 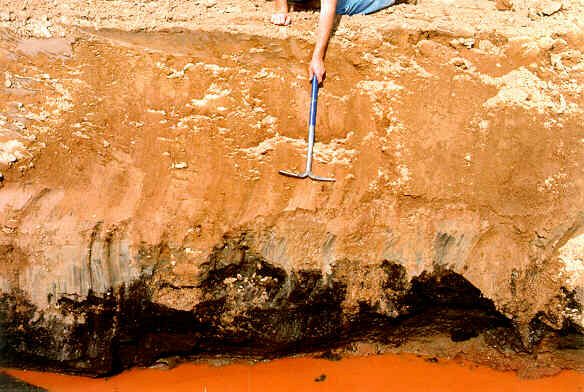 Radiocarbon dating of the peat produced an age of 3.6 ka (GSC-6448). This Holocene age is intriguing, in light of the thick silty deposits on top of the peat, which suggest a different hydrological regime in the area during this time. Anyone interested in this? 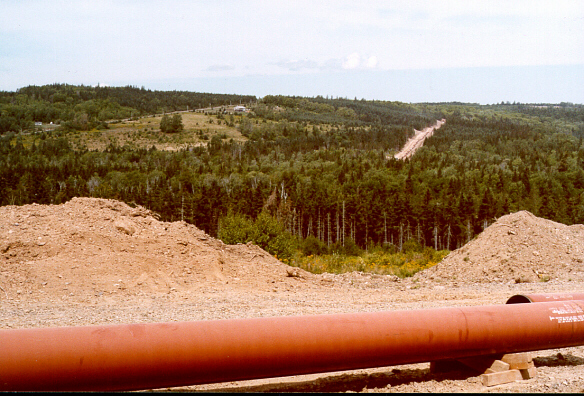 Site in Pictou County on the side of a large hill. The buried organic site is located near the road that crosses the Great Ditch in the middle of the photo. A thin peat layer with clay at the base (seen as a black zone at the base of the ditch) is buried under nearly 3 m of reddish-brown boulder-clay (diamicton or till for glacial geologists). 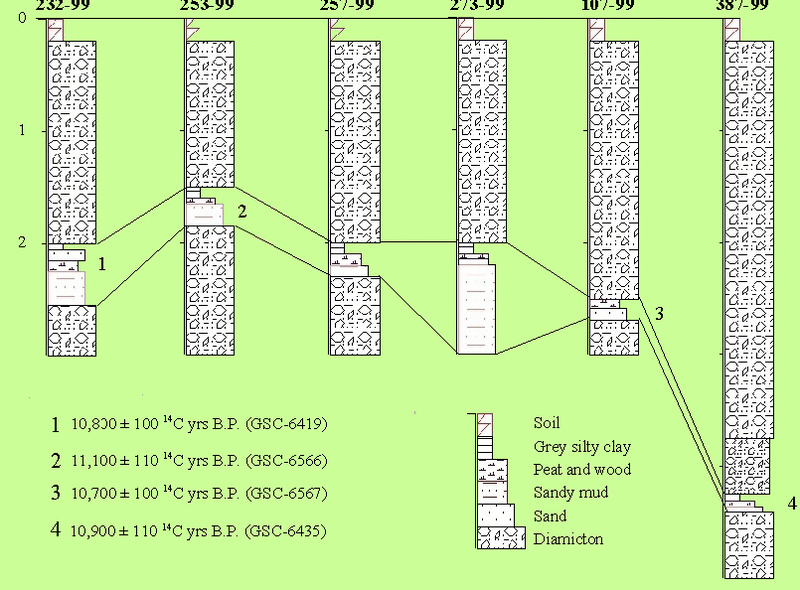 There were no large wood fragments from this organic zone for radiocarbon dating, but the peaty soil layer was used and produced a radiocarbon age of 10.7 ka (GSC-6567) (~12.8 CAL). Another buried peat layer was found under till in a gently undulating till plain near Amherst, east of site 99-56. The thin peaty clay layer-soil which you can see at the base of the trench can be traced through the till ridge in the background to the other side. 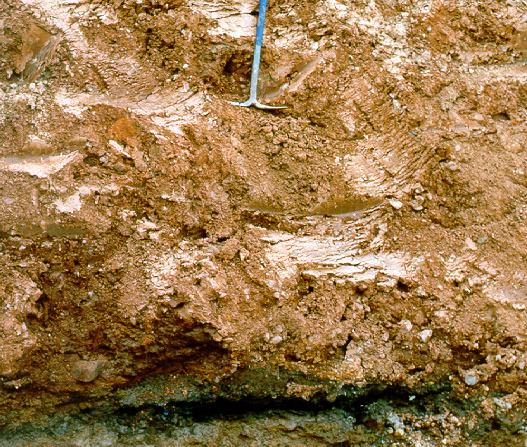 Topographic undulations that overlie the buried peaty soil may be glacial fluting. The overlying till deposit has layers of boulders with some diorite erratics, derived from the Cobequid Highlands to the south. These erratics may be reworked from older deposits, as the flow direction of the glacier that deposited the overlying till is probably southward. A close up of the 10 cm thick peat layer, with greyish clay lying above and below. Buried peat from an adjacent locality produced a radiocarbon age of 11.1 ka (GSC-6566) (~13.1 CAL). A till fabric analysis was completed in the upper reddish till (diamicton). The southward fabric trend is parallel to the predominant trend of glacial ridges (flutes and drumlins) in the area. 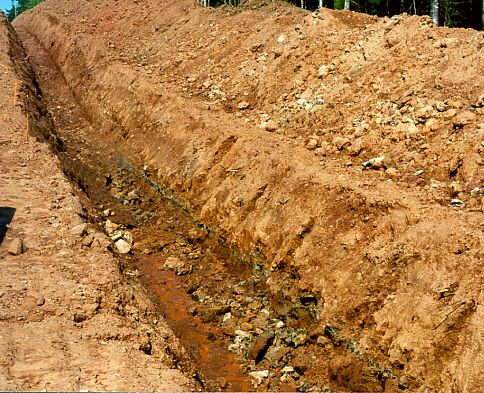 Another buried peat-soil layer can be traced under ~10 m of till in a ridge which was cut to accommodate the pipeline. The site is located in the background under one of the secondary ridges which lie on the larger bedrock-cored hill whose top is about 100 m in elevation. 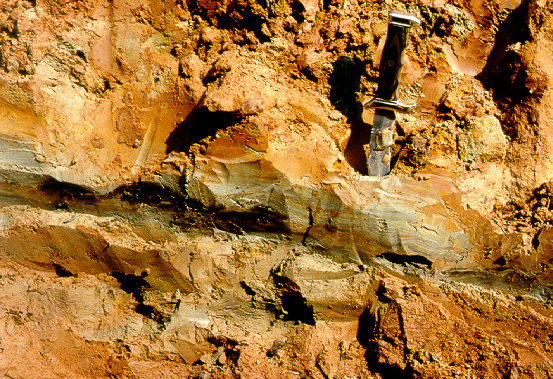 The peat layer is seen at the base of the trench as a black layer. The till above is an indurated greyish-brown silty diamicton with a strong oriented clast fabric indicative of glacier processes. A till fabric analysis indicates an eastward trend, which is at variance to other late-glacial ice flow features in the region and may represent eastward deflection of southward-flowing ice around the Cobequid Highlands. 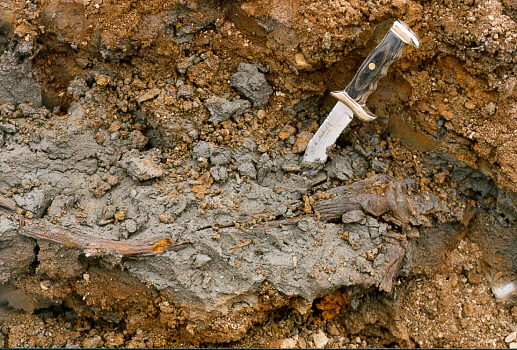 Close up photo of a large piece of wood, suitable for conventional radiocarbon dating, obtained from the peat layer. A radiocarbon date of 10.9 ka (GSC-6435) (~13 ka CAL) was obtained on the large willow ( salix) fragment. View a correlation diagram of all the till/covered sites along the pipeline route. The diamicton overlying the soils-peat layer throughout the Northumberland Strait region is interpreted as a glacial till based on its compactness, fabric, landform expression, and distribution. It is the surface till plain throughout the region and was formerly thought to relate to a late northwestward ice flow based on striae and surface erratics derived from the Cobequid Highlands to the south (Stea and Finck, 1984). 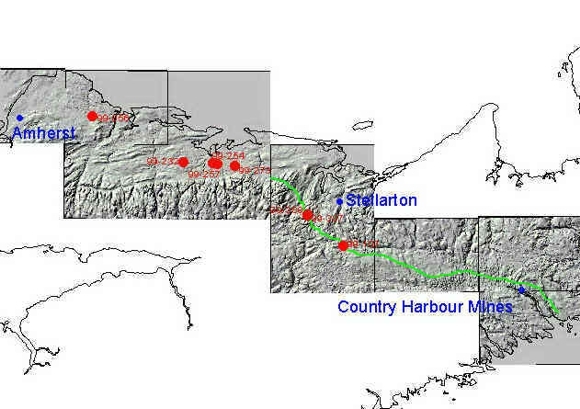 They noted, however, that the content of Cobequid Highland erratics drops off markedly in the lowlands east of the Wentworth Valley, where the till-buried organics are found and a kame complex at the mouth of the Wentworth valley has a negligible Cobequid Highland erratic content. This implies a late southward ice flow (Prest et al. 1972). Stea and Finck (1988) postulated a final southwestward flow from the Gulf of St. Lawrence based on arcuate moraines and a few striation sites along the Northumberland Strait. The till sheet on the pipeline route that overlies Allerød paleosol displays fabric trends parallel to fluting on the till plain. The southward-trending fluting observed beyond the ice margin, on the Cobequid Highlands, relates to earlier Late Wisconsinan maximum southward ice flow from the Gulf (Escuminac Phase). Belts of hummocky ground moraine and arcuate moraines define the retreat margins of the former ice mass which probably ended its brief re-advance with regional stagnation and downwasting. The presence of glaciolacustrine deposits in the Wentworth Valley and along the north flank of the Cobequid Highlands requires an ice dam to the north. It is significant that no paleosols were found in the coastal sections along the Northumberland Strait coastline in spite of extensive surveys (e. g. Stea and Finck, 1988). 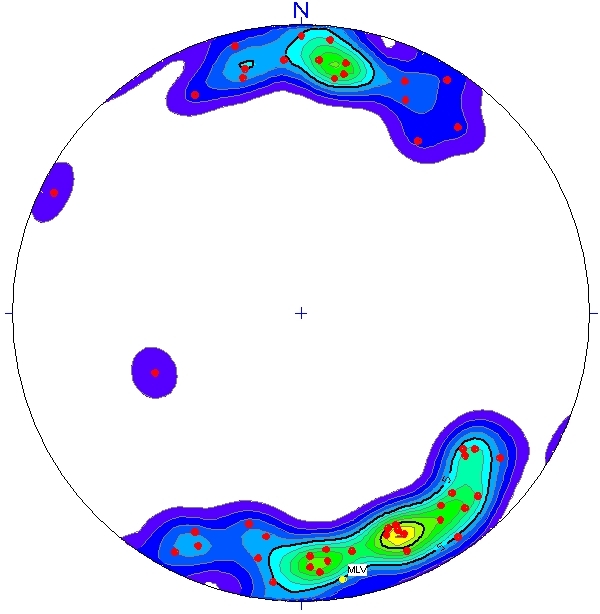 The lack of an Allerød paleosol can best be explained by a remnant ice mass in the eastern Northumberland Strait (Kranck, 1972) that covered these regions and later re-advanced approximately 10-20 km over ice-free areas to the south. 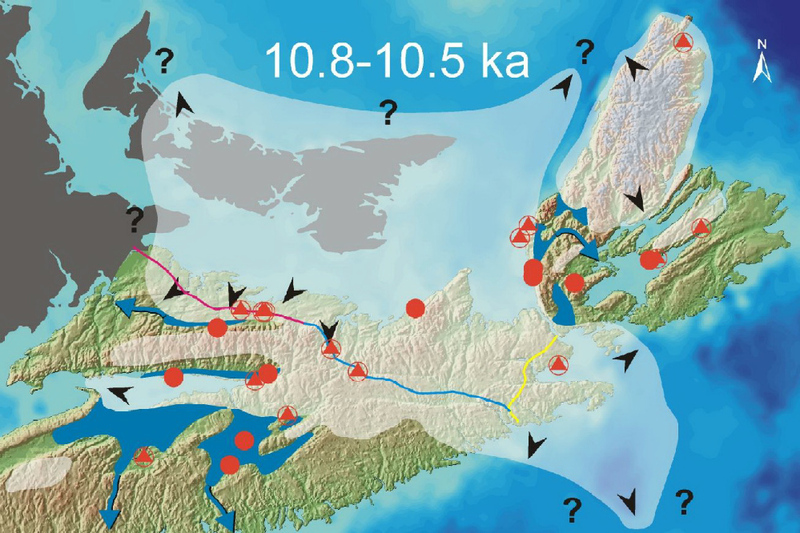 The persistence of ice in the eastern Gulf of St. Lawrence and P. E. I. is verified by radiocarbon dates on lakes in P. E. I. no older than 10,000 radiocarbon years B. P. Stea and Mott (1998) proposed a Younger Dryas glacier in the Gulf of St. Lawrence, largely on the basis of ice-dammed, varved lacustrine sediments overlying peat found along the coasts of northern Nova Scotia and Cape Breton. 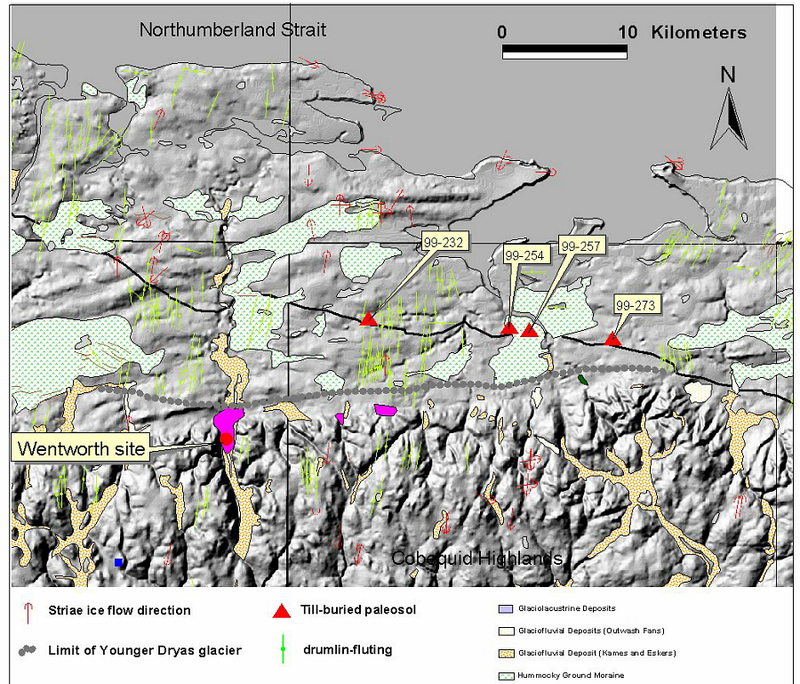 The widespread distribution of the Younger Dryas till along the Northumberland Strait coast establishes without doubt the validity of a Younger Dryas Gulf of St. Lawrence ice cap. The thickness of till and the elevation at Stop 387 suggest much more northern Nova Scotia ice than modelled in our previous reconstruction. The few lakes in this region that have preserved a pre-Younger Dryas sedimentary record must have been spared from glacial erosion. Read Stea and Mott (1998) for the story prior to these discoveries. 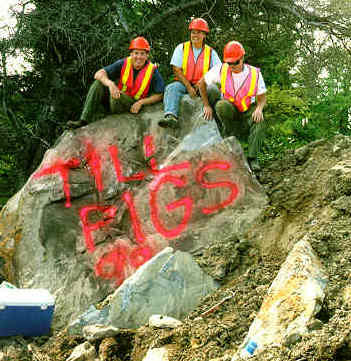 I would like to acknowledge the fine work done by the till pigs without whom the pipeline and 6000 pounds of Nova Scotia soil would never have been sampled. Left to right. Charlie Jessome, inventor of the till toss; Angela Ford, finder of fine wood fragments; and David Cowan, rock identifier extraordinaire. Geomorphological development and post-Pleistocene sea level changes, Northumberland Strait, Maritime Provinces; Canadian Journal of Earth Sciences, v. 9, p. 835-844. Quaternary geology, geomorphology and hydrogeology of the Atlantic Provinces; 24th International Geological Congress, Excursion Guidebook, A61-C61, 79 p.
Patterns of glacier movement in Cumberland, Colchester, Hants, and Pictou Counties, northern Nova Scotia; in Current Research, Part A; Geological Survey of Canada, Paper 84-1A, p. 477-484. Quaternary geology of northern mainland Nova Scotia, sheets 10 and 11; Nova Scotia Department of Mines and Energy, Maps 88-13 and 88-14, scale 1:100,000. Reading Room 1: The story of glaciers in Maritime Canada.